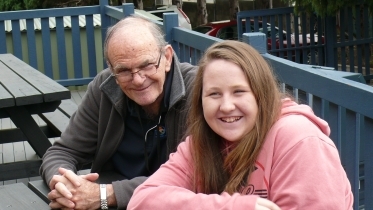 An intergenerational mentorship program in Toowoomba is turning lives around. On a shaded park bench in Toowoomba, a young woman talks animatedly to an older man who nods his head and listens. At first glance you might not think they have much in common. But they are part of an award winning mentoring program that’s gaining a lot of attention. The project pairs two groups of people in Toowoomba who often feel marginalised – young people at risk of leaving secondary school and older people who after a lifetime in the workforce can feel socially isolated and undervalued. 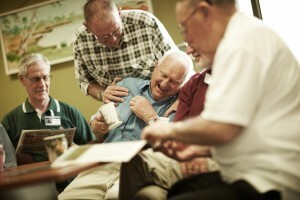 The result is an intergenerational mentoring project that is turning people’s lives around. The program is a partnership between Toowoomba Older Mens Network (TOMNET) and Toowoomba Flexi school – an annexe of Centenary Heights State High School. Flexi School is an alternative education site catering for 70 senior secondary school students who for one reason or another have become disengaged from mainstream schooling. 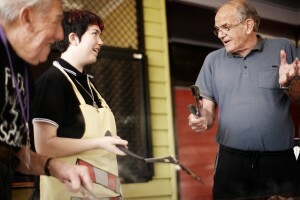 TOMNET is a not-for-profit community organisation established in Toowoomba in 2001 to support older men in regional, rural and remote locations in southern and south-west Queensland. In 2006, an informal ‘drop in’ mentoring program began with older mentors offering advice and practical skills to assist young people to complete their schooling. In 2008, with funds from The Rotary Club of Toowoomba East, the program was developed so pairs of mentors and students worked together on literacy and oracy skills. This year 15 pairs of year 10 students and their TOMNET partners will take part. That doesn’t mean it’s not challenging. Mentors do most of the listening and encouraging students to talk. But active listening is a real skill, Melinda says, so training helps mentors develop this. Topics for discussion between mentors and students draw on topical issues such as local drink drivers and the causes and consequences of such behaviour. Mentors might share what things were like when they were the same age or share information from their own experiences. Melinda says feedback from former students is very positive. ‘One person wrote on her evaluation sheet “It made such a difference to me to think that there is someone who can’t wait to see me each week and who takes the time to listen and hear what I have to say.” Those kinds of comments are typical, Melinda says, and show the kind of impact the one-on-one program has on participants.